Style is difficult to define, but easy to recognize. When it comes to your wedding style, what do you want the world to see? It would be easy if we all had only one, cohesive style: Louboutin-wearing tycoon; sweet romantic; boot-loving country girl; or pure elegance. However, most of us enjoy a different style at different times. But when it comes to your wedding style, this could make you look as if you’d been painted by Renoir and Picasso at the same time! That is why deciding on a perfect wedding style is so important. You want your style to reflect your very essence, but how to start? You’ve undoubtedly been collecting wedding pictures for inspiration. Review the pictures that really speak to you and ask yourself what they have in common. Is it a fairy tale gown? An over-the-top wedding venue? This will help you decide what is really important to you. It will also eliminate any irrelevant side issues. Finally, ask yourself one question. “How would I describe my wedding in one sentence?” This will strike at the core of how you picture your wedding. Perhaps you’ll come up with the answer immediately. “I’ve always wanted to get married at the beach.” Or it may take days. 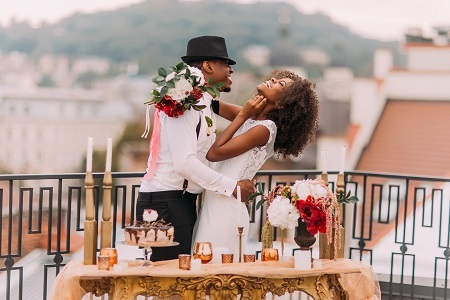 It will, however, help you narrow down your wedding style and can help you decide on your menu and decorations, as well as that all-important gown. 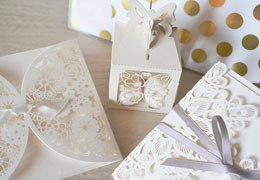 Once you’ve answered that question, your wedding style will quickly fall into place. Let’s take a look a different wedding styles and how best to integrate the entire wedding into one beautiful, cohesive look. At heart, you’re sophisticated and chic. You want your wedding style to reflect this. Classic weddings tend to take place at first-rate hotels, country clubs, or a lovely estate rental with a formal garden. A modern classic touch would be a museum. It’s unlikely that you will have a buffet. A sit-down dinner or brunch is more your style. And your cake will be beautifully decorated. The idea of a food truck at your wedding makes you shudder. There’s nothing extreme about a classic wedding. The colors should be neutral shades, with one or two vibrant touches. You couldn’t care less that orange is the color de jour. Your wedding will stand the test of time. You’re not really an eclectic type of bride. Your budget will determine much of the décor, but you do enjoy a touch of luxe, whether its lovely china or classic table linen. Your gown will have traditional accents of lace and satin. Pearls are your natural accessories. As for flowers, you see roses everywhere. If roses are out of season, you can be very happy with calla lilies. Your makeup is understated to let the real you shine through. Nothing annoys you more than having to follow arbitrary rules. You may not be “out there,” but you are uniquely you. You strive for traditional with a twist. You may opt for a traditional church wedding, but are just as likely to get married in a non-religious ceremony with the officiant and vows of your choice. Your venue will be stunning, but out of the box. A botanic garden, a yacht, or museum are your natural settings. When it comes to your wedding meal, you bypass the traditional steak, chicken, or salmon. Instead, your reception will likely have food stations that cater to contemporary lifestyles, including vegetarian and gluten-free. A dessert bar is more your style than a traditional tiered cake. You are likely to embrace a few soft colors, but will insist on bold or metallic touches. Your wedding gown may be white, but it can also be a hushed pink or delicate ecru. You’re invariably full of surprises. While your gown may be understated, your accessories and decorations will be bold. Vibrant, cascading orchids of many colors will make up your centerpieces and wedding bouquet. You are the artiste in a family of professionals. You’re blue jeans in a room filled with designer suits. A natural romantic, you are blissfully at home in the outdoors. And that’s the most logical venue for your wedding. Walls cannot contain you. You won’t even consider a classic, fitted wedding dress. Your gown is as flowing and free as you are. The color will be inspired by nature’s own palette. Your hair may flow in soft waves or be braided, accessorized by a crown of flowers and greenery. A tiara? As if. 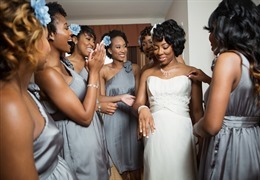 The bridesmaids may wear mismatched dresses. You decorate your wedding venue with hanging flowers or dream catchers. You’ll rely on the setting, whether the beach, a garden, or a park, to set the mood. The food at your reception is eclectic. You might very well combine food trucks with a traditional wedding cake. Do you ever feel as if you’d been born in the wrong time and place? Do you long for a more romantic, gentler time? A vintage wedding may be for you. The theme can embrace anything from the Victorian era to the Jazz Age. The venue can be anywhere and as formal or informal as you choose. It’s the old-time touches that are important. Since we are talking about bygone eras, your primary shopping will take place in antique stores. The bridal gown should be all about delicate lace. The bridesmaids can wear flapper dresses and carry colorful parasols. Have the groom channel his inner Gadsby with a vintage suit and pocket watch. Anything vintage can serve as memorable décor. Tea or cookie tins, old books and newspapers, or a Victrola. Resale shops will be your treasure trove. If you are fortunate enough to have photos, especially wedding photos, of grandparents, put them on display. Your entertainment can include a lot of 20’s jazz, and a barbershop quarter would fit right in with the theme. Of course, you will be dancing to Big Band Era music. Have a Charleston or Jitterbug dance contest, with a prize for the winning couple. Forgo a modern buffet and serve 50s-style burgers and milkshakes and fried chicken. Or set out a speakeasy menu of oyster Rockefeller, cheese plates, deviled eggs, shrimp cocktails, and bowls of mixed nuts. Instead of a wedding cake, or in addition to the cake, set up an ice cream social area. You might forego the wine and beer and have a bartender serve martinis and gimlets. Anything with gin, actually. Rustic weddings are especially spectacular in the fall, when the leaves are afire with colors. 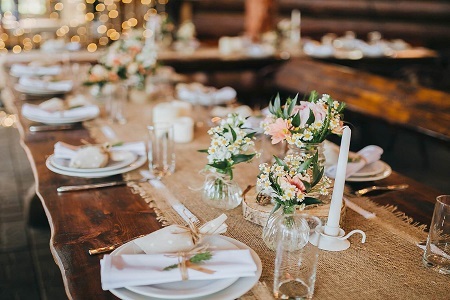 The degree of formal is up to you, but rustic weddings are all about charm. Decorate with mason jars and string lights along the ceiling of a country barn. The wedding gown can be simple without a lot of frill. Off-the-shoulder is especially attractive. Boots are always welcome at a rustic wedding. Print your menu on a large blackboard. For a rustic wedding, comfort food is the way to go. Stuffed chicken, macaroni and cheese, or grilled steaks. A wedding cake is fine, but homemade apple or cherry pies would be more in keeping with the country theme. Whether you are an urban sophisticate or a country girl, your wedding day is the most important day of your life. It should reflect exactly who you are and what you want. Fifty years from now, you want to look at your wedding photos and smile.